When we talk about Indian women clothing, one of the first thing that comes to our mind is the salwar kameez or the churidar kurta. Today, this Indian dress has entered not only the domestic market in full swing but also has made a huge impact in the International fashion world as well. The popularity and demand for salwar kameez have reached almost every corners of the world and women are not hesitating in trying out new styles and patterns. The traditional design of the salwar suit has undergone tremendous changes over the years. When we talk about the patterns of salwar kameez, we mean the styles and designs available in this dress. From Anarkali to tight churidar kurta, from Pakistani suits to the Patiala salwar suits, from Bollywood salwars to the designers ones, there are various types and patterns available in this traditional dress of Indian women. Similarly there are lots of options available in neck and back patterns, including sleeves and lengths. The salwar kameez patterns have undergone lots of changes. Gone are those days when women used to wear only the traditional styles. Fashion magazines, fashion designers, models, Bollywood heroines have shown how the dress can be modified and make it look all the more trendier. The major area where the designers are experimenting are the churidar kurta neck designs. U neck, V neck, pointed u neck, boat neck, noodle strap, mandarin collar, bandh gala, round neck, and many more are available. Neck designs are further highlighted with embroidery, beads work, patch work, lace work etc. Similarly from full sleeves to half sleeves to short sleeves, bell sleeves, slitted sleeves, there are many variations here also. Thus, there are no limits in the salwar kameez patterns in terms of designing on neck, back, body, sleeves, and fitting. Even the pants or the salwars have different cuts and patterns like as traditional salwar, churidar, patiala salwar, parallel, bootcut, dhoticut etc. There are custom stitched or ready made salwar kameez available in the market. 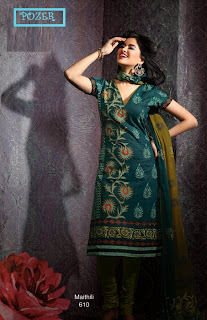 Depending upon the creativity of the designers, the patterns of salwar keeps on changing.